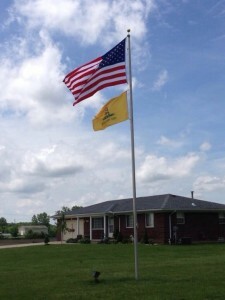 Revolution Flag Group Flagpole Installation Division is also prepared to assist you with your new flagpole installation. Revolution Flag Group’s flagpole installation division is comprised of dedicated, experienced professionals who are able to help you with the consultation of a new flagpole. The members of the flagpole installation have decades of experience in new flagpole installation. Our crews are capable of assisting with the installation of both residential flagpoles as well as commercial flagpoles throughout the State of Michigan. The flagpole division is capable of assisting in the decision making process of installing a new flagpole from the location of the pole to the best type of pole. They will strive to make sure that the installation does not interfere with your day to day operations and will always be courteous to you as well as your customers and will make sure to leave the job site the way it originally was for the exception of a gleaming towering new flagpole with the American Flag flying proud. Flagpoles include: gold ball top, halyards, flag clips, cleat, flash collar and ground sleeve.